Lampre-Merida been sold to a Chinese firm. It means there will be no Italian team in the top flight of the sport, a first. While welcoming interest from around the world it’s still astonishing to imagine that the land of Milan-San Remo and the Giro, Coppi and Barali, Nibali and Aru won’t have a major team. Rather presumptuously the photo includes the UCI World Tour logo but like all teams it will have to be vetted for 2017 by the UCI’s Licence Commission to make sure it’s got the budget, contracts and a strong enough roster to merit a place. As a bit of background Chinese President Xi Jinping’s communist government has made sport a priority, especially soccer. While Russian oligarchs bought soccer teams and other sports assets as a way of placing part of their wealth abroad to prevent it being looted, there’s a now a wave of spending by the Chinese elite on football and other sports that’s seen by some as a patriotic effort, a pact where these billionaires put some of their wealth into sports with the aim of improving China’s performance. The big sport is soccer – Xi is a fan – so this is where most of the billions with the aims of building a competitive domestic league and developing world class players but now it seems some of the Renminbi are flowing to cycling too. In reality Lampre-Merida has quietly been a Swiss team for some time, or at least that is where the legal entity behind the team has been based, presumably for tax purposes. In the image above CGS Cycling AG is this same Swiss firm. It’s also been dependent on revenue from Taiwanese bike manufacturer Merida too. Still teams can opt to fly under any flag they wish when it comes to their UCI nationality and Lampre-Merida have been riding as an Italian team ever since the fuchsia kit was first introduced in 1992. The point here is that Lampre-Merida was never 100% Italian with its Taiwanese bikes and Swiss tax base so the sale is almost a continuation of this process rather than a shock. Other Italian teams have gone. Liquigas became Cannondale at the end of 2013 but we have to jump back to 2005 to find other Italian teams in the top flight with Saeco and Domina Vacanze. In other words there have only been two top flight Italian teams in the last decade. The paradox is that if the teams are going, everything else is going well. The calendar is full of Italian races and the pro peloton is packed with Italians. The chart above shows the number of race days in 2016 with Italy in third place thanks to a rich calendar. Note China is doing well too. As for the pro peloton Italy has the second highest amount of riders, only France supplies more riders to the World Tour, only most of the top Italian pros already ride for foreign teams. 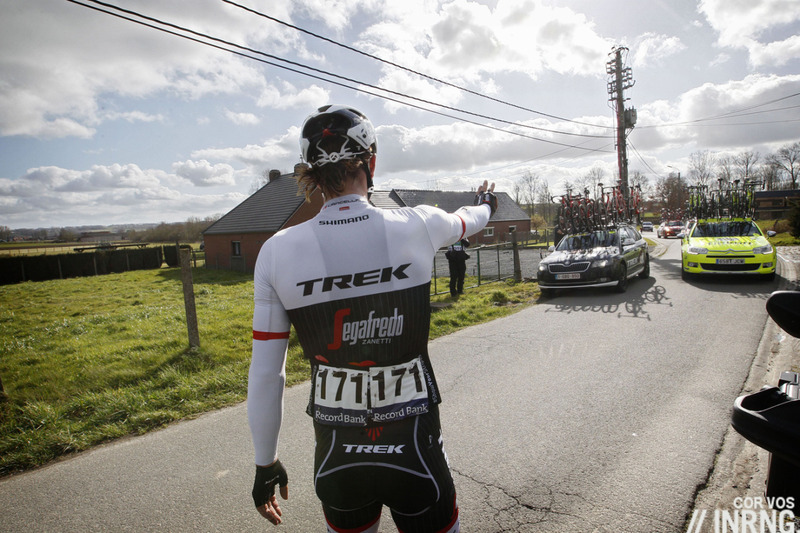 There’s also a thriving U23 scene and a rich network of cycling clubs. If anything the pyramid is strong, all that’s missing is the World Tour team as a capstone. The comparison with France is interesting, the French benefit from the enormity of the Tour de France, a huge shop window that’s simply more valuable to sponsors than the Giro d’Italia. Yet for all this big value it’s not attracting too many new names, FDJ and Ag2r La Mondiale have been sponsoring their teams continuously since the 90’s. Europcar made the World Tour for a while but as good as the shop window is, few French sponsors want a World Tour team. A French federation project to create a Gallic version of Team Sky has fallen as flat as a crêpe. Where are the Italian sponsors? Back to Italy and is the recession to blame? The economy’s been in a slump and fears a banking collapse and there are various institutional log jams and none of this will help. It’s not just cycling, Silvio Berlusconi is selling his AC Milan soccer team to a Chinese consortium. Everyone in China must know about Ferrari and its red sports cars but just a short ride up the road from its Maranello factory are other factories belonging to the likes of Ariostea and Panaria, both firms that have backed top pro teams in the past but today they’re surely unable to return given the costs associated, maybe €10 million to fund a team capable of stage win in the Giro. But pedal on and you can pass the Stadio Mapei, a sports stadium backed by the Italian adhesives giant which had its eponymous super team and still capable of backing a team if the will was there. Italy has the companies but it’s a matter of enthusiasm and contacts. Look at Segafredo which has opted to join up with an American team. All is not lost for Italian cycling. It’s turning out to be very good at exporting it services. Astana is a Kazakh team but has hired in Italians as riders and management alike. The new Bahrain-Merida team is the same with a lot of Italian management and co-sponsors. Now Lampre or whatever it will be called in 2017 will see Italians running the team and providing the savoir faire that no Chinese sports directors or team owners yet possess. With Lampre becoming a Chinese team there will be no team from Italy in the World Tour in 2017. The death of Italian cycling? Of course not, no Italian team deserves a World Tour licence on the grounds of nationality but it’s astonishing that country with a home grand tour, a thriving calendar, many riders, a conveyor belt of U23 talent and a decent corporate sector won’t have a team in the top flight. A lot of the rationale behind this Chinese takeover is because China has next to none of this. We can see the Chinese interest as a metaphor for globalisation with prodigious foreign wealth displacing Italian brands but this takeover is more than a trend seen around the world from African mines or European robotics or American laptops. It’s not just the Chinese trying to reach “western” levels of cycling, it’s also the story of the gradual retreat of Italian cycling sponsorship, once Liquigas went it left one team in the World Tour and this was increasingly international. Italy’s lack of a World Tour team is a long term issue rather than the story of a licence changing hands. Merida are sponsoring the Bahraini team so it’s likely Lampre get a new bike sponsor. What chance Colnago given the Saronni connection? I thought Argon-18 was linked with this team? Colnago’s not been involved during the entire time with Saronni, so why now? Any News on RCS stelling the Giro? Is it still up for sale? No. RCS itself has been bought this summer by rival Italian media firm Cairo Communications so the new owner could have new plans but nothing’s being mentioned in public. The race is also part owned by a family, the Bonacossas, so they have to agree to it too. Thanks, I’ll trust you on this and delete the sentence about Li Zhiqiang. Just been checking out TJ-sport, doesn’t seem to be a big company but very cycling dedicated. They even have a base located in a cycling centre with an outdoor velodrome, a 13.5km road circuit and a 6.8km mountain bike circuit. Their main business so far is actually cycling race organising. They ran a low level race in south China (Tour of Po Yang Lake, on going for 5 years now, actually good landscape to cycle), as well as some mass participation charity cycling event (Love China). They recently formed a partnership with another Chinese Sport/Travel Company Sky&Grass (well, its name sounds a lot more poetic in Chinese with the English translation not really up for scratch. 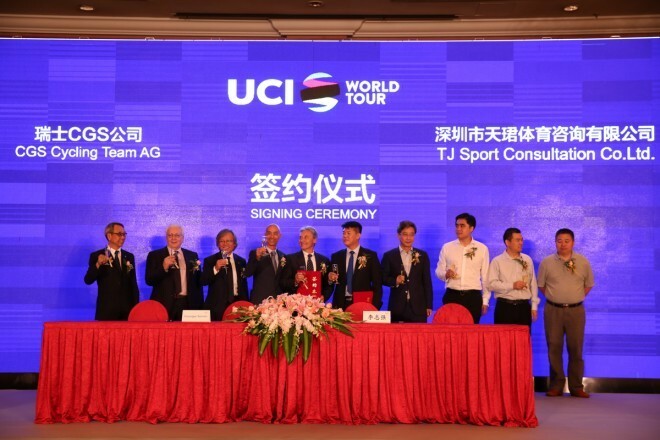 What’s notable about this company is that they actually ran the first ever “cycling sport development fund” in China, dedicated to invest in competitive cycling related projects) in organising several other cycling events. The main game of these companies are looking at cycle tourism as a form of luxury tourism. Naturally, there’s a real estate element in there. Whilst Li Zhiqiang on the Forbes list is not involved, another Real Estate Billionaire of China probably is. Fong Lun, founder of Vantone Holdings, a real estate investment consortium with deep governmental link, was present at press conference that announced the partnership between TJ-Sport and Sky & Grass despite not having any formal engagement with either companies that I can find. It is very likely that Fong is the financial backer behind this partnership as well as the purchase of the lampre licence. Given his governmental ties, he may very well be helping the companies gain local government support in their race organising adventures. Far from astonishing – mostly just sad. Sad the forces unleashed by “Heinie’s Folly” have driven up the costs of sponsoring a top-tier team so high only gambling interests, bike companies and rich chamois-sniffers are willing and able to put up the money required. Sad that little has been done to eliminate the risk of doping scandal, so few others with money want to get involved. Sad that the economic crisis makes things even worse. But no matter whose name is on the jersey or who writes the paychecks, Italians will continue to add to their vast cycling heritage, tifosi will demonstrate their passions and Italia will remain the best place on earth to be a cyclist or cycling enthusiast. Biased? Very! But 20 years ago we could have just as easily started CycleFrance but we chose ITALIA – for reasons more to do with that passion and heritage (not to mention the food!) than profit potential. W ITALIA! Don’t worry – your region is still one of the cycling hotspots. I would however direct a lot of blame at Italy’s political and economic decision makers – the country’s economic woes are mostly homemade and it is a shame. What does it mean for a team to be from country X? E.g., I doubt the cycling team of this article are suddenly going to dump their Italian staff and relocate their base to China. As another example, “Giant-Alpecin” are often referred to as a German team, but a lot of the stuff are dutch and the management company is based in the Netherlands – I assume their team base is too. And as inrng points out, this “Italian” team’s management company is registered in Switzerland. I think perhaps the whole notion of a cycling team being from a certain country is somewhat confused and ill-defined in cycling. I don’t know, but I think this is good. Some real exposure in China and potentially more sponsorship interest down the road? 18 teams vying for the the 17 slots in the WT is mostly a good thing (though i still think less WT teams would ultimately be best). In Larry T’s insular world it would still be just the French, Dutch, Belgians vs. those swarthy hordes from Italy and Spain. No other nationalities need to apply to cycling. Not trying to pick a fight but your “18 teams vying for the the 17 slots in the WT is mostly a good thing” made me laugh. Is the UCI’s scheme now to adjust the number of WT teams so that there’s always one less place than the number of teams they think are interested? Otherwise 17 seems an odd number, though I do share your view there should be less – if we have to have “Heinie’s Folly” the top dozen teams would be a better number. As to my “insular” world view, I have no issues with folks from other nations getting involved – what I object to is UCI handouts to places which are never likely to have much interest in cycling (the “sandbox classics” for example) at the expense of races and places that do. The sandbox races aren’t ideal Larry, but they serve a purpose. They’re mandated to take the race that actually matters to all of Italy. Problem is that the comuni (particularly in the south) can’t pay and won’t pay. So he’s left with a big hole in the finances, and foreign starts and races run off before one man and his camel exist to fill it. Tutto li. Good point Herbie. But the economic crisis and continued doping scandals also have some effect on money available to pay for my beloved Corsa Rosa. The “sandbox classics” are a much more recent development than the much longer term problem you describe. ASO certainly doesn’t need the loot, but aren’t they involved with some of those as well? PS-great to see you on here, your insights and opinion will add a lot to INRNG. “Swarthy hordes”? Careful cd, you might appear insular yourself. To wit , a bigot. That was a dig on all the Anglos on here who are always so suspicious of the Spanish and Italians of doping but could never see it in someone like G for insurance. Or maybe JTL, who they’ve convieniently forgotten. How can Larry T only want traditional Euro nations in cycling – he’s American, if it wasn’t for the globalisation of cycling he never would have found cycling. I agree with Larry T, races need to meet certain pedigree markers before they jump to WT – cycling’s WT is very watered down with races that have zero place at the highest level of competition. Cycling in the US goes back to the 18oos……Larry’s prime time. Careful don’t wake Larry up he is napping. Surprising the # of US race days. Thank god we have the UCI point system to make that relegation decision, where right now Cannondale, the team that didn’t get a single top 5 in the biggest event, the Tour de France, are ahead of Dimension Data, winner of most stages of all teams in the same event. And apparently it’s because Cannondale got 3+4 GC in the Tour de Pologne, how exciting! It’s a bit of a squeeze and suddenly a rider with good haul of points has become very valuable now. Dimension data scored stage wins in a few WT races this season, not only Tour de France. I think there were 2 stage wins in the Dauphine and 1 in the Tirreno-Adriatico. Add the TDF stage wins to that – and any points scale that leaves Cannondale ahead in the rankings this year must be seriously flawed. Interesting that the nationality of a cycling team is defined by the nationality of the sponsor. Indeed, BMC Racing is a case in point, a US team by the rules but with a Swiss owner/funding/bikes. If there a lack (or none!) of Italian sponsors, is there a debate to be had about reducing the number of race days in Italy? Even by Madiot’s thinking, the WT teams race the local events to please sponsors? Ergo, if there are no sponsors…? This shouldn’t be a surprise really, eastern money has changed the face of just about every major European sport. How many major football clubs are European owned, not many. I’m not sure what they get out of it, but they seem to enjoy it nontheless! There are however still a lot of big companies in Italy and I wouldn’t be surprised if somebody saw this as a sort of national disgrace and decided to sponsor a team. I hope they do! To me it is slightly odd that this still takes on a nationalistic attitude rather than just reporting on a new owner of a team. We live in confused times where are politics seem to be heading to nationalistic isolation whilst the actual economy continues to be global with a disconnect between brand, design, manufacture and ownership. There really should not be any difference as to who rides or owns a team beyond them do so well and in an honest and positive way for the sport. I would rather see sponsors continuing to fund the sport than not. We also read some time ago on INRNG how odd it is that teams are named by sponsors. I think we will have the rise of owners teams with sponsors as in F1 or football, where the owners take a more centre stage position and provide more visible continuity. This will be driven as new markets and entrants alter the way things are done – Sky has arguably had the most impact in this respect in the last few years ( i don’t know what UK teams were in the world tour prior to them). I’d like to see foreign sponsors funding European races. There’s already too much money spent on teams. 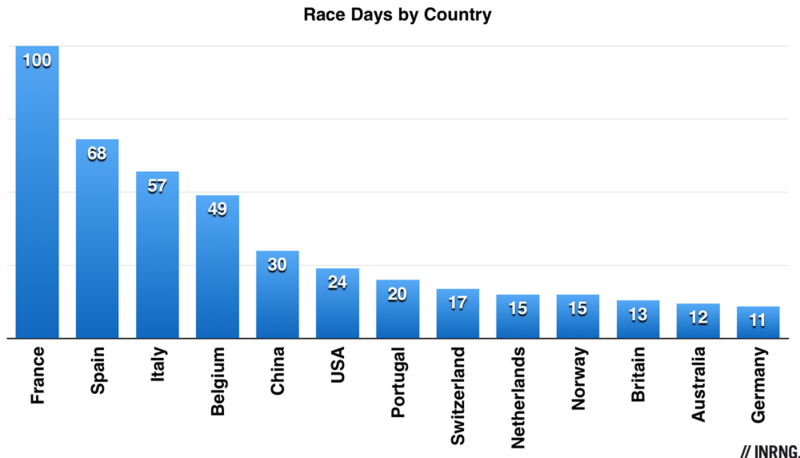 To which level races are count in the race days by country chart? I mean this is all a bit inane. who really cares. whether this country or that country is promoting your favorite 2 wheel producing toy company. did anyone notice all these bike parts are manufactured in china, even your beloved colnago and campagnolo. get out and ride your (chinese) bike. It’s a big deal to people in Italy not to have a team in the top flight any more, it’s a notable moment. if it was such a big deal in Italy I am sure it would not have come to this. You don’t care for the wages of the people who make your bike? I think is a very big deal that Chinese company has become a team owner. Targeted at Philip : From a financial perspective there is no doubt that the Chinese economy means a lot to the world. There is no doubt the financial situation of cycling has not been perfect, this provides a starting point for additional investors. Furthermore for some riders, this just made the transfer market quite a bit more attractive – I am sure Henao and Majka would agree. Institutions and corporations interested in cycling are putting a lot of money into the Gran Fondo world (cyclosportives). Ultimately, it’s being drawn away from cycling as a fully competitive sport. Pro races and teams struggle also because of that. It’s not pure chance that Cassani asked for a part of the GF’s revenues to be injected back into the juvenile world of competitive cycling – otherwise, Italian cycling would soon be dead or, better said, reduced to the business of private entertainment, spiced by sort of a very flawed sense of competition. The economic crisis and the doping scandals play a role, but it’s a minor one: on the contrary, you wouldn’t see the very long list of sponsors you can admire in most GFs’s webpages. The GFs aren’t exempt at all from the need of financial backers nor from serious (*huge*) doping troubles, which ended up more and more often in the news of the general media system. Good points – but I’d think the amount of sponsor money required to get into the GF game pales in comparison to what’s required to back a top-tier pro racing team. And of course a sponsor of a GF doesn’t face much in the way of scandal when the “winner” is found (how much testing is there?) to be doped vs a sponsor of a pro team. The second aspect you underline is debatable: the amount of polemica which surrounded positive riders in GFs, mechanical doping, ex dopers racing, suspected dopers racing and so on, and on, and on… is simply astonishing. Di Luca and Santambrogio being caught didn’t raise half of the buzz the “cheating in the GFs” thing produced. What’s sure is that most GFs’ management knows how to protect their business, something that the FCI and the riders’ unions rarely do. Lots of reasons for that (football among them). It was all about “little” (not really that little, but it’s a comparative concept) manufacturing. Which means that when cycling changed, becoming more global and bigger, while losing grip on the local scale, it lost part of its interest for that kind of business. Besides, companies like Mapei or Liquigas are 50 or 100 times smaller than, say, Movistar (Telefónica), both in terms of revenue and of employees. And when cycling becomes more expensive *in itself*, as it did in recent years (not at all because of “the crisis”), Movistar may decide that it’s worth upping its game… the impact on the general figures of the company will be, proportionally, 50-100 times smaller than for Liquigas, Mapei and the likes (Saeco, Gewiss, whatever). It’s not like you couldn’t have any big Italian companies available… Generali, Intesa San Paolo, Unicredit, Telecom Italia, Enel, Eni, or, on a smaller scale, Italcementi (now sold out to some German firm, I think), and many others. Sometimes they’re even interested in cycling. Yet, the world of cycling *management*, that is the people with the expertise to build up a pro cycling team, is too far, way too separated, from the *social world* of the people who might decide to fund a pro team within those companies. They prefer to invest money into the Giro (Enel), local U23 teams (Generali)… not a team. A big responsibility lies on the National Federation, which is all about politics and doesn’t focus at all on fostering cycling from an economic POV. All in all, it’s more about cycling becoming too expensive than “the crisis”, the Italian economy’s general dimension didn’t change as much because of the crisis as because of the increasing cost of a pro team and the traditional social role/position of our sport in Italy (don’t forget that a crisis might be about one digit percentage shrinking of the economy, the cost of a pro team became *two or three times* greater…).